What can you do when you have a nice CNC machine, but build beautiful things like this 3-axis gimbal? We covered some of [Gal]’s work before, and he does not subscribe to the idea that hacks should look like hacks. If you’re going to spend hours and hours on something, why not make it better looking than anything you could buy off-the-shelf. The camera is held stationary with three hollow shaft gimbal motors with low cogging. We weren’t aware of hollow shaft motors, but can think of lots of sensor mounts where such a motor could be used to make very compact and smooth sensor mounts instead of the usual hobby servo configuration. The brains are an off-the-shelf gimbal controller. The gimbal has a DB9 port at the back which handles charging of the internal LiPo batteries as well as giving him a place to input R/C signals for manual control. The case is made from CNC’d wood and aluminum. There are lots of nice touches. For example, he added two buttons so he could fine tune the pitch of the gimbal. Each button is individually engraved with an up/down arrow. [Gal] reverse engineered the connector on Garmin action camera he’s using so he can keep it powered, stream video, or add an external mic. Next he built a custom 5.8Ghz video transmitter based on a Boscam module. The transmitter connects to the DB9 charging port on the gimbal. It’s very cool when someone builds something for themselves that’s far beyond anything they could buy. A few videos of it in operation after the break. Do you have a depressing basement? Maybe you still live with the parents? You need a fake window to cheer things up! As it turns out, it’s pretty easy to make a convincingly real-looking day-light window — plus you could totally mess with your circadian rhythm! [thatdbeagoodbandname] has an office in his basement with no windows, which is why he set out to brighten up the room with this project. Apparently you can buy fake LED windows, but they’re expensive and don’t look that good. His goal was to build a cartoony “classic” window that would feel bright and uplifting — and to keep it well under $200. Scientific research, especially in the area of robotics, often leverages cutting-edge technology. Labs filled with the latest measurement and fabrication gear are unleashed on the really tough problems, like how to simulate the exquisite sensing abilities of human skin. One lab doing work in this area has taken a different approach, though, by building multi-functional sensors arrays from paper. A group from the King Abdullah University of Science and Technology in Saudi Arabia, led by [Muhammad M. Hussain], has published a fascinating paper that’s a tour de force of getting a lot done with nothing. Common household items, like Post-It notes, kitchen sponges, tissue paper, and tin foil, are used to form the basis of what they call “paper skin”. Fabrication techniques – scissors and tape – are ridiculously simple and accessible to anyone who made it through kindergarten. They do turn to a Circuit Scribe pen for some of their sensors, but even this nod to high technology is well within their stated goal of making it possible for anyone to fabricate sensors at home. The paper goes into great detail about how the sensors are made, how they interact, and how they are interfaced. It’s worth a read to see what you can accomplish with scraps. For another low-tech paper-based sensor, check out this capacitive touch sensor keyboard. Spice is a circuit simulator that you should have in your toolbox. While a simulator can’t tell you everything, it will often give you valuable insight into the way your circuit behaves, before you’ve even built it. In the first installment of this three-part series, I looked at LTSpice and did a quick video walkthrough of a DC circuit. This time, I want to examine two other parts of Spice: parameter sweeps and AC circuits. So let’s get to it. The power in R1 (voltage times current) is .5 W or 500 mW if you prefer. You probably know that the maximum power in a load occurs when the load resistor is the same as the source resistance. 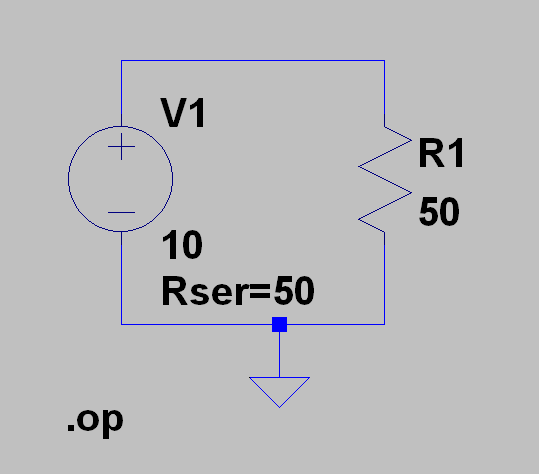 The Rser parameter sets the voltage source’s internal resistance. You could also have created a new resistor in series with V1 and set it explicitly. [Nguyen Duc Thang]’s epic 2100 Animated Mechanical Mechanisms is one of the best YouTube channels we’ve ever seen. A retired mechanical engineer, [Nguyen Duc Thang] has taken on an immense challenge: building up 3D models of nearly every imaginable mechanism in Autodesk Inventor, and animating them for your amusement and enlightenment. And, no, we haven’t watched them all for you, but we’re confident that you’ll be able to waste at least a couple of hours without our help. If you’re actually looking for something specific, with this many mechanisms demonstrated, YouTube is not the perfect lookup table. Thankfully, [Nguyen Duc Thang] has also produced a few hundred pages of documentation (PDFs, zipped) to go along with the series, with each mechanism classified, described, and linked to the video. This is an amazing resource as it stands, and it’s probably a good thing that we don’t have access to the 3D files; between the filament cost and the time spent shepherding our 3D printer through 2,100 mechanisms, we’d be ruined. Good thing we don’t know about the Digital Mechanism and Gear Library or KMODDL. Thanks [alnwlsn] for the tip! One of the easiest ways to make PC boards at home is to use the toner transfer method. The idea is simple: print the artwork using a laser printer and then use a clothes iron to transfer the toner from the paper to a clean copper clad board. The toner is essentially plastic, so it will melt and stick to the board, and it will also resist etchant. There are several things you can do to make things easier. The first is the choice of paper. However, the other highly variable part of the process is the clothes iron. You have to arrange for the right amount of heat and pressure. If you don’t do a lot of boards, you’ll probably have to make several passes at getting this right, scrubbing the reject boards with acetone and scouring pads to clean them again. [Igor] had enough of the clothes iron and knew that other people have used lamination machines to get the toner off the paper and on the blank board. He started with a commercial laminator but hacked it for PID control of the temperature and made other improvements.